Royal Caribbean scam on Flickr? I have to say that I was pretty flabbergasted when I got this email. Let’s just say that having dealt with RCL’s customer service, I know they don’t pull amateur plays like this and if their marketing department DID indeed pull this off then it’s a really poor job at doing something with a business. So why did this email ring up like a scam? First, it was sent from a Flickr account to my Flickr account. Not from an official email from Royal Caribbean or a RCL address and it wasn’t addressed through my RCL account. In fact, it was manually typed since the person actually messed up my account name. Guess some people don’t read. Second, it had an email to Yahoo. Who the heck uses a free Yahoo email for anything business related? Very interesting isn’t it. It seems that JWT is a supposed marketing firm or something. But even so, you would still think that Royal Caribbean Cruises Ltd. would own the registration. Still pretty dang strange. So, with all of that? I called RCL customer service. They knew nothing about this, so they said they’d forward it up through security and find out since it did look awfully suspicious. They said that they’d call back if they needed more information and I agreed to forward them whatever I had. Then Flickr got an email too. Why all this precaution? When it comes to marketing a brand like RCL, you can never be too careful with scams, especially one that has such great customer service. If indeed it’s a marketing gimmick or campaign, then it’d be better to have it shut down due to security reasons than to taint the brand itself. Either way, from a technically capable person viewing it as a customer of RCL, I wouldn’t want to see this type of thing go on. Ever. And believe me, online scams are a plenty as it is and tracking them isn’t always as obvious. If you’re legitimate but bells ring screaming scam, then you’re doing something very wrong. Hopefully they get it sorted out. But for now, I would avoid entering any sort of RCL survey that is originating from Flickr. 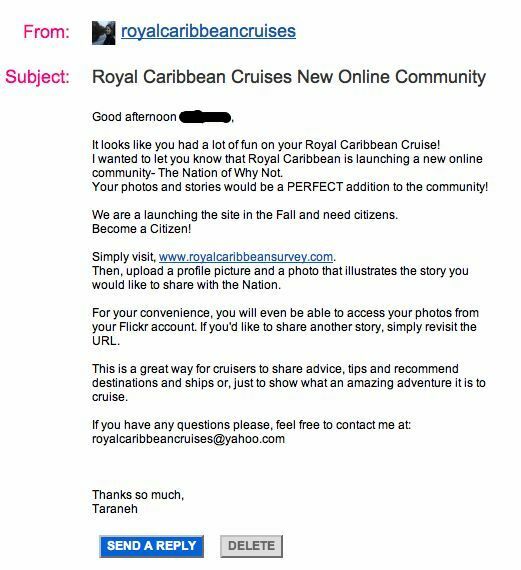 If it’s not coming from the official mailing list for Royal Caribbean, I would be extremely weary that they are doing anything with Flickr.